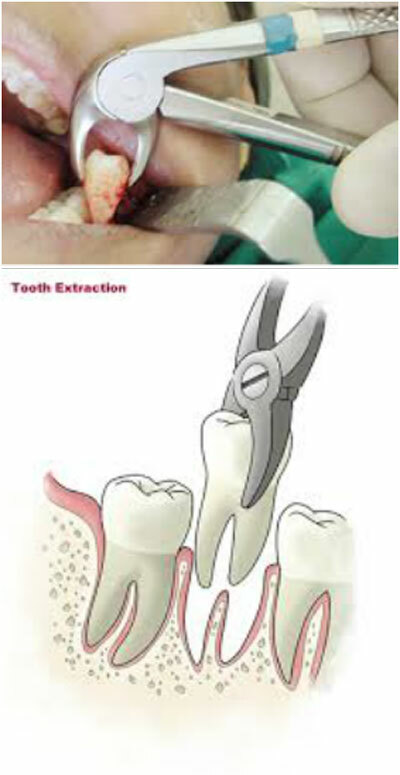 Exodontia is the Surgical act of extraction/removal of a tooth. A tooth may require extraction for various reasons, from a tooth deteriorated by caries and that is no longer possible to reconstruct, a fractured tooth, a temporary/primary tooth that does not fall by itself, planned extractions as part of an orthodontic treatment plan, a tooth infection,an abscessed tooth, or an impacted wisdom teeth. In some cases patients may decide to extract a tooth that can be restored due to the costs of retoration. The first step of having a tooth extraction (including wisdom teeth extractions) is to come in for an assessment. We have a policy of treating all emergencies on the day so an appointment is not necessary. However you may be required to wait for a while depending on how full our appointment book is. You will be attended to ASAP. Often we can remove or extract your tooth at that first visit, which will relieve your pain. You may require antibiotics before or afterwards to prevent an infection which will be prescribed to you if necessary. The loss of a tooth however can give rise to a significant disequilibrium in the masticatory system. A tooth remains in its position thanks to the support given by the neighboring teeth, the opposing tooth and contact with tongue and cheeks. When a tooth is lost, the posterior tooth begins to drift forward and the anterior tooth backwards, and the opposing tooth begins to extrude. This can lead to loss of the point of contact of the teeth, generating gingival and periodontal problems between the neighboring teeth. In this way, dental loss that started with a single tooth can extend to the other teeth, therefore careful consideration should be given before the removal of teeth. A full mouth X-Ray is usually taken to show the exact position of your wisdom teeth. From then we will be able to give you advise on what procedure is required and an accurate estimate of costs, downtime, to heal time and book an appointment for the extraction of your wisdom teeth. In some cases, you may be referred to a Specialist Maxillo-Facial and Oral Surgeon if it is deemed necessary. The removal of your tooth will be painless with the help of local anaesthetic (injections). For some who would prefer to not be conscious during the extraction, there is also the option of general anesthetic or even conscious sedation. This would be discussed at the appointment. After the tooth is removed, you may need stitches. You can gently bite down on a cotton gauze pad placed over the wound to help stop the bleeding. With regard to post-operative complications. alveolitis is the most common and is due to the loss of the coagulum/blood clot, and the exposure of the bone tissue with subsequest bacterial infection. The usual symptom is intense localized pain, which can feel like a toothache. Normally a salt pack twice a day for 48 hours with some antibiotic cover, will allow normal healing to progress. The removed tooth can be replaced with an implant, a denture, or a bridge. After your extraction, it is best for your to be on light duties and rest for a day to maximise healing. If you have any stitches they will need to be removed in approximately one week.